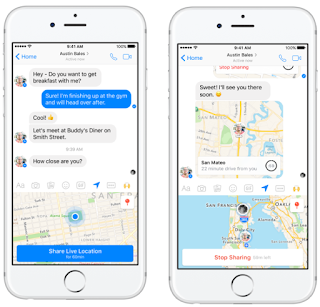 Facebook Social Media chat updated a new feature that allows registered users to share their live location with friends on Facebook messenger application platform. 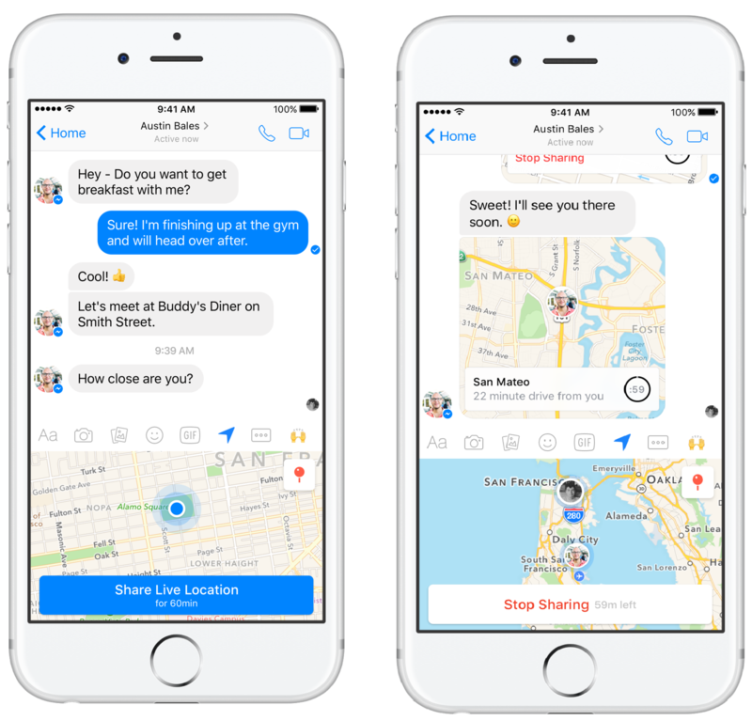 This new feature of live location sharing on Facebook messenger is powered by Google map. And goes a long way to let your friends when shared, know your actual location at that moment. The new feature is actually sharp and nice, it is just similar to Whatsapp's Live location tracking. Now with this feature you can share your current location with some selected people, may be on Facebook group or to family members, it can also be sent to single user. The choice is yours to select the set of people who to share your current live location with. Facebook made this new feature to have an option where logged in users can stop the FB service from functioning if they don't want it anymore. And when you must have shared your live location to your friends on Facebook, it will be available for 24hours. So if you want to know the time remaining for the live location shared, just on your facebook messenger app, you will see a small count down clock where that will be shown to you. So both you that shared and the person or group you shared it to will be able to see the current estimated time it will take you to locate your friends location through car. ==> Check Out Twitter Social Chat Recent Update Concerning the 140 character limit on tweet replied. If you choose not to share your current location with friends, you can as well go for option to share a static point on the map. So to share a static location, just click where you see location Pin and then click on the red pin at the top right corner of the screen. When you are done with that, search for location or just drag and drop the pin on any part of the map. Remember, you need to have Facebook account, and next is to login with that created account details in order to access this newly updated feature made on Facebook messenger app. So whether you are using Android Apk device or iOS like iPhone, ipad, iPod etc. Just go to app store for iOS and Google play store for Android and download, and at same time install the latest version of Facebook messenger app.